One of Nashville’s first scenes on Wednesday night turns out to be a perfect encapsulation of the episode. Will is taking a shower when he hears his song being played on the radio. In his jubilation, he hops out of the shower, still soapy (thank you, wise and generous person who made this happen), and begins dancing around the bathroom. Then, soap gets in his eyes, causing him to cry out in pain. 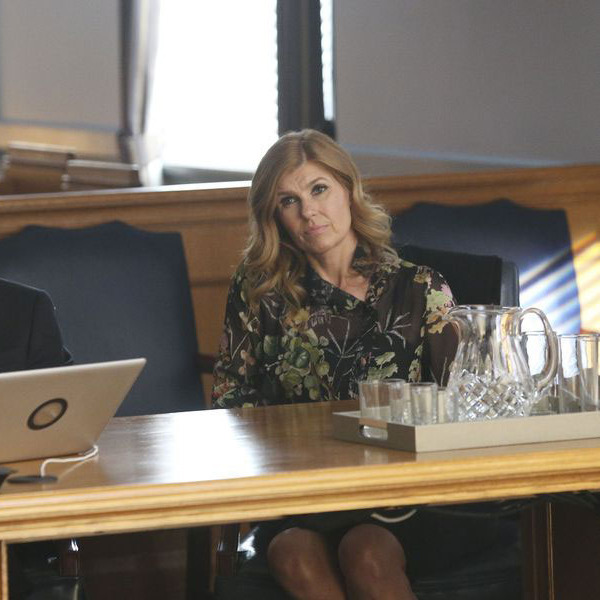 Of course, the most miserable of the miserable — the miserabilis maximus, if you will — have to be Rayna and Deacon, who are about to go to Maddie’s emancipation hearing. “You’re a good mother,” Deacon tells Rayna, reassuringly. At first, despite the unfortunate presence of Frankie, things seem to be going pretty well in court. Rayna makes a strong case that Mother knows best and nobody can love or care for her daughter more than she does. Sensing that things are going south, Cash suggests something ominously called the “alternate strategy” (actually, “nuclear strategy” would’ve been more like it). Maddie seems reluctant, but finally agrees, and proceeds to get on the stand and testify that she is afraid of Deacon’s rages. (Remember when the worst thing about Maddie was that she rolled her eyes a lot? I miss Garden-Variety Annoying Teen Maddie.) It gets worse. They call Deacon to the stand and Maddie’s lawyer starts doing some version of This is Your Life from hell, where she recounts every single one of his bad deeds from back in his drinking days. It’s a laundry list of horrors that includes brawls and car crashes and even the two times he hurt Rayna — the drunk-driving accident and that one time he accidentally gave her a black eye. Deacon is mystified. Who could’ve told Maddie’s lawyers such personal details about his life? And then he locks eyes with Frankie. It was Frankie the whole time! Okay, putting aside the absolute immorality (and perhaps illegality?) of your AA sponsor sharing your secrets in court, what is Frankie’s damage? In fact, what is the damage with that whole family? Why do Cash and Frankie hate Deacon and Rayna so much? If the answer is simply that Frankie is still resentful of Deacon for bulldozing his way into The Beverly and Cash is just super committed to Maddie’s talent — NOT GOOD ENOUGH, NASHVILLE. I mean, this is some next-level revenge happening here. I want answers. By the end of the episode, Deacon’s in jail, Rayna’s not talking to him (totally justified), and the judge has granted Maddie her emancipation. You win, Deacon and Rayna! You had the worst day ever! The best thing about all of this is that Emily runs to Avery and gives him a lot of grief and is totally Team Juliette. “I just hope you didn’t sleep with Layla to keep yourself from being with Juliette,” she says, which is a little none-of-her-beeswax-y, but also a valid point that needed to be said. Later, Juliette overhears Layla telling Avery that if he wants his space, she cares for him so much, she’ll give it to him. That girl can fake sincerity with the best of them. Both Juliette and Avery are snookered. Avery says that, no, he wants to give this crazy thing a try. And Juliette decides that Layla’s intentions are pure, after all. (No, Juliette! Trust the face! The face never lies!) She goes to Layla and tells the truth, apologizing for her role in Jeff’s death. After that, Juliette runs into Avery backstage. “Are you happy?” she asks him. Onto Scarlett and Gunnar, who — much like Juliette when she got her Oscar nomination, and Will before the soap got in his eyes — start their day out in a pretty good mood. They wake up in bed together and (adorably) scamper downstairs because they’re late for a Rolling Stone interview, even doing a cute bit where Gunnar helps Scarlett with her necklace clasp and they almost steal a kiss in the elevator. (Not for nothing, both of their haircuts are on point in this episode.) At first, the interview is going great, with Scarlett and Gunnar (adorably) holding hands under the table. But then the reporter starts bringing out details from their past: Zoey, Gunnar’s brother, the ill-fated marriage proposal (the reporter found out about it from Autumn, natch), and, by the end of the interview, not only are they no longer holding hands, they’re barely speaking to each other. Onstage, Scarlett tries to flirtily sidle up to Gunnar, but he wants no part of it, turning away from her. She recovers like a boss and they manage to give a great performance. The reporter finds them backstage. “Given everything you’ve been through … why is finally working right now?” she asks. “It only works because we’re the Exes,” Scarlett says pointedly. Finally, some crazy TV talk-show host named Cynthia Davis doesn’t want Will Lexington’s music on the air because it’s promoting the “immoral gay lifestyle.” Do people like this really have talk shows? Granted, I am safely sequestered in my little East Coast, NPR-listening bubble, but it seems a bit extreme. Anyway, born-again gay-rights activist Luke Wheeler goes on the show to make a case for Will and is doing great, until his satellite feed suspiciously goes out right in the middle of an answer, giving the impression that he wouldn’t be happy if Colt were gay. Remember how Will’s day started, with happy naked dancing? By the end of the day, some assholes have spray-painted gay slurs all over his car and Cynthia Davis is calling for a boycott of any station that plays his music. The good news? If he wants to feel any better about his life, all he needs to do is call Deacon and Rayna.